The goal of this post will be to explain how to transfer a large physical DVD collection over to a desktop/server or home theatre PC using free (as in beer) software. We will try to streamline this process and will show you what can be used to play your collection. Due to the potentially large collection of DVD discs many people may own this project had few important requirements for the software. All DVD copy protection and region encoding needed to be removed. Readers in the USA should note that under the Digital Millennium Copyright Act it is illegal for most consumers to bypass or break any form of digital copy protection. Legally there is no personal fair use granted to consumers in the USA to bypass or break DVD copy protection schemes for the discs they own. This means that by following these instructions, technically readers located in the USA will most likely be breaking the law. Only the movie and primary audio tracks were to be ripped to the PC with out any extras or menus. The movie data needed to copy over as quickly as possible. We needed to transfer the movie in its original format with no transcoding or additional compression. Streamlined ripping interface to keep user prompts to a minimum. I ended up going with DVDFab HD Decrypter software by Fengtao Software which can be found at http://www.dvdfab.com/hd-decrypter.htm. DVDFab is an easy to use tool for DVD/Blu-ray ripping and conversion. While most the DVDFab suite is shareware you do not need to pay for software as the HD Decrypter component we use is freeware. A Windows PC with a DVD or compatible disc drive which is able to read your DVD discs. 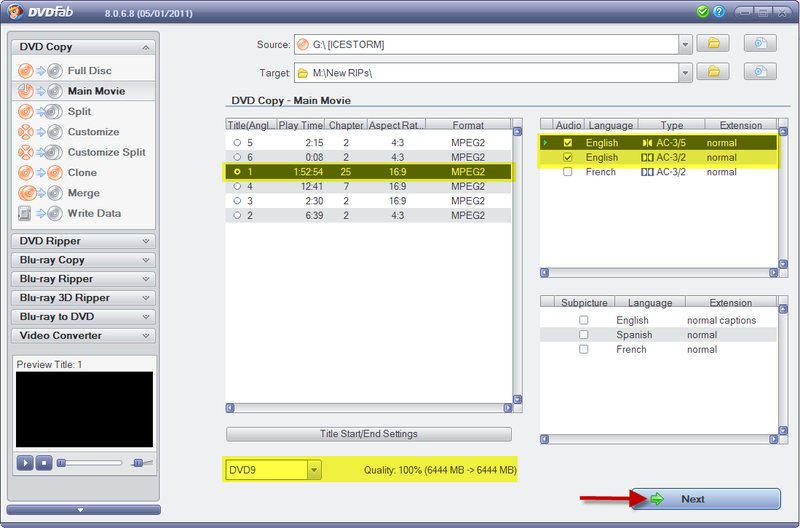 DVDFab HD Decrypter software by Fengtao Software mentioned previously which can be found at http://www.dvdfab.com/hd-decrypter.htm. A large hard drive big enough to hold your transferred collection. Two identically sized drives would be preferred, one to hold the movie collection and one to clone the hard drive for use as a backup. You would hate to transfer over 500 discs and then loose it all to a faulty disk drive! How much space you’ll need depends on your collection. On average a movie will require between 3.5 to 7 GB though some longer movies (The Godfather Part II, Lord of the Rings etc) do span multiple discs. As a conservative estimate you’ll need about 5 GB per movie or a terabyte for every 200 movies. Media centre or Home Theatre PC software to organise and play your collection. This software needs to be able to read the DVD VOB container format (http://en.wikipedia.org/wiki/VOB) when stored on a computer hard disk. My recommendations would include Boxee (http://www.boxee.tv/), VLC Player (http://www.videolan.org/vlc/) or XBMC (http://xbmc.org/). Download and install DVDFab from http://www.dvdfab.com/hd-decrypter.htm. On the DVDFab Welcome Screen check Do not show again and click Start DVDFab. We will not be using any of the trial software for this project. 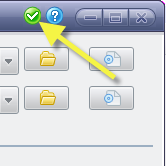 Select the green Settings button that contains a tick. Go to General. You may want to check Memorize User Interface Options. Change your Output directory. I am using M:\New Rips but you could use something that is easy to remember such as C:\Movies. Uncheck Creates files in subfolders of output directory. If you have a graphics card with a GPU by ATI/AMD or Nvidia you can use these to improve the ripping throughput. While you are in General, select the sub-menu A/V Codex. 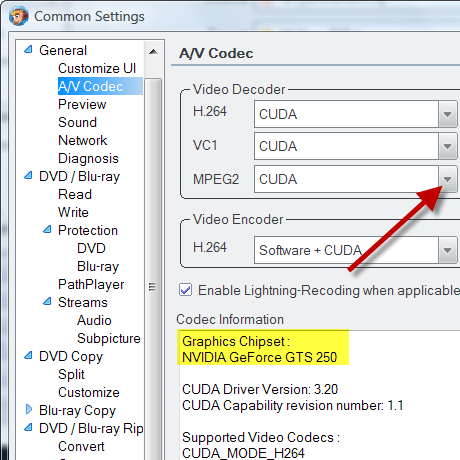 Under the Video Decoder section find MPEG2 and change its mode from software to either DXVA for ATI/AMD cards or CUDA for Nvidia cards. Go to DVD Copy and change the Default output size from DVD5 to DVD9. DVD5 refers to a single sided disc and is only useful if you want to burn your movie to a DVD-R. As we are just ripping to a hard disk we do not need to shrink or split the DVD rip to a smaller factor. Otherwise this could be a time consuming and a not very productive process. 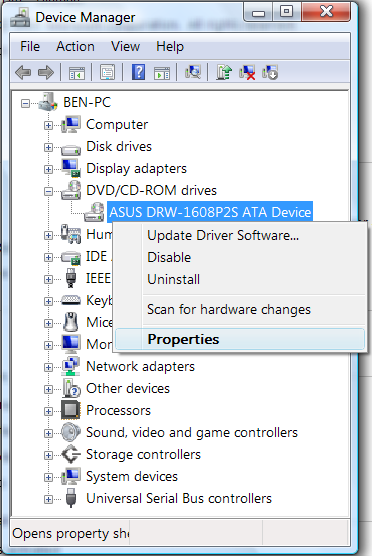 Change the Default output type from DVD writer to DVD folder. If by default you do not want any subtitles. Go to DVD / Blu-ray, Streams, Subpicture and check Do not preselect any subpicture track. Then press OK to save your changes and close the settings dialog. Now you can either rip the Full Disc using the current default selection. Or we can save hard disk space and time by just extracting the movie with selected audio tracks by ignoring all the extra features, advertising, menus, etc. To rip the movie rather than the whole DVD select Main Movie from the DVD Copy menu on the left. Change the Target from the default to your preference. Insert the DVD disc you wish to copy into your computer’s DVD drive. 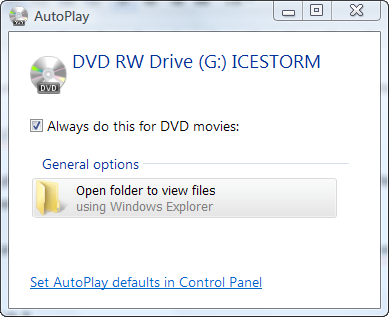 If you get a Windows AutoPlay prompt when you insert the disc I’d suggest turning it off. When prompted by DVDFab select the DVD disc region. Feel free to check the Do not show again. 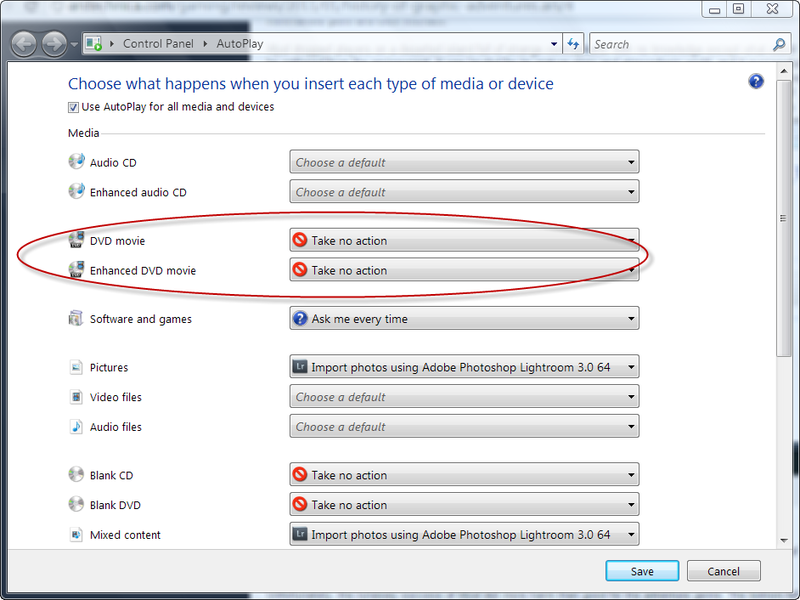 If you ever need to change this in the future you can go to Settings, DVD / Blu-ray, Protection, DVD. DVDFab will spend a few moment scanning the disc. In my example I am happy with the default options. 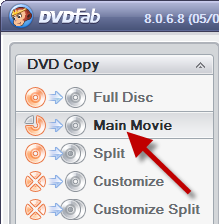 DVDFab is intelligent enough to select the movie on the disc as well as the English audio and sound tracks. Your mileage maybe different depending on which DVD you use. DVDFab lets you know how much hard disk space the rip is going to use. You can decrease this size by removing audio tracks you don’t need. If you want an explanation of the most common types of audio tracks, see the Audio Tracks paragraph near the end of this article. You will generally find the movie’s year of theatre release on the back of the DVD case. Once you are ready press Start. Depending on your computer hardware and the movie length the ripping process should take somewhere between 10-20 minutes. When your rip is complete DVDFab will play a notification audio and eject the DVD disc. From here you can select Finish to start the ripping process over again with a new movie. 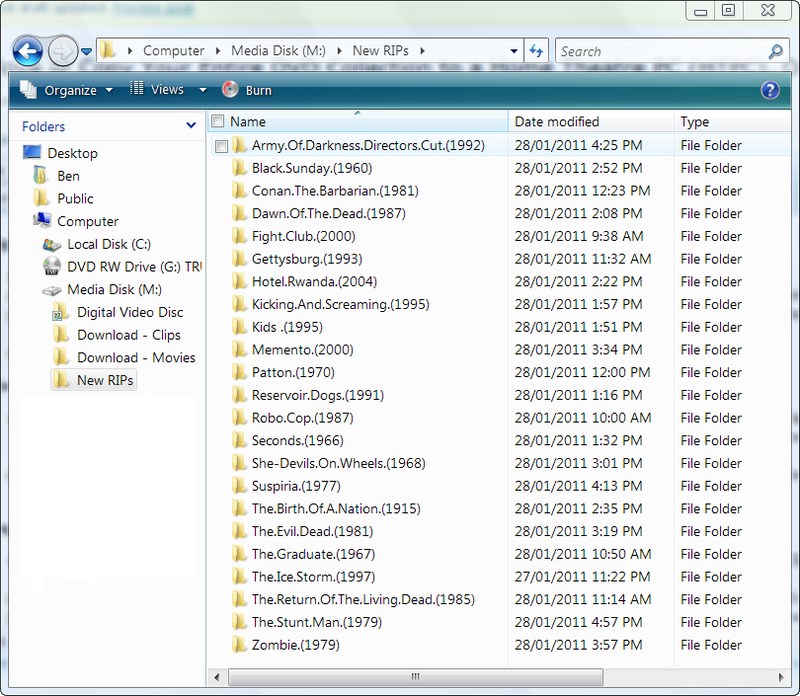 You can use Windows explorer to go to your movies folder to browse over your completed DVD transfers. If you want a media centre platform to display and play your DVD rips I’d recommend Boxee for first time users. The Boxee software (http://www.boxee.tv/make) is quite well known due to the recently released and uniquely designed Boxee Box by Logitech (http://www.boxee.tv/box). While the Boxee Box hardware is geared towards fetching and streaming online content for use on a TV. The standalone Boxee software is a less focused, more all round media centre which is what you will probably want. One potential negative is that while the Boxee software is free does require you to create a user login account to run the required social elements of the software. 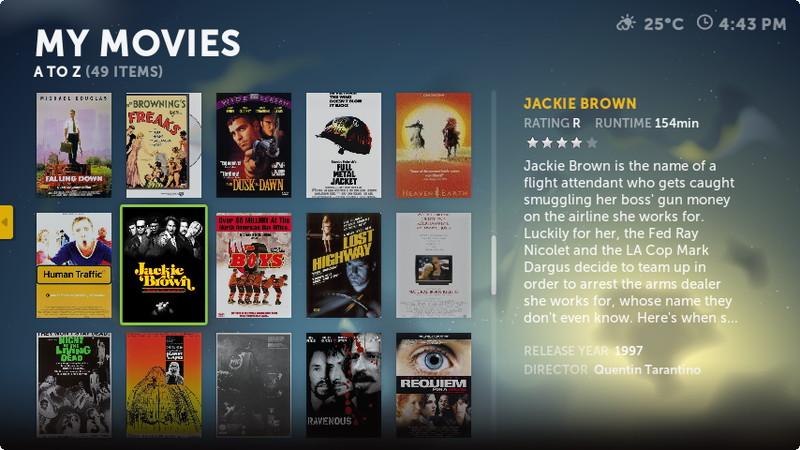 The alternative to Boxee is the free and open source XBMC (http://xbmc.org/). XBMC was once an acronym for XBox Media Centre but now days it is primarily a piece of PC software since the original XBox has long fallen out of use. Boxee is actually a software fork of XBMC and so in many ways the two are quite alike. XBMC is much more customisable but the trade off is greater complexity. If you do plan on using XBMC I’d recommend changing the default Confidence skin to something else. Confidence and a couple of other skins such as Transparency! and Xpreience do not understand the folders generated by our ripping process. To change the XBMC skin use your keyboard arrow keys to navigate down to System and press Enter. Then navigate to Appearance, Skin, then use the right arrow key and enter or mouse to select Skin again. In the skin dialog select Get More… and install the following skins, Back Row, Mediastream Redux, Night, pm3.hd, Shade to try each of them out. Remember just press Esc a few times to quickly return to the XBMC Home screen. If you need to add a folder on your computer to the library goto System, Video, Library, Import video library. 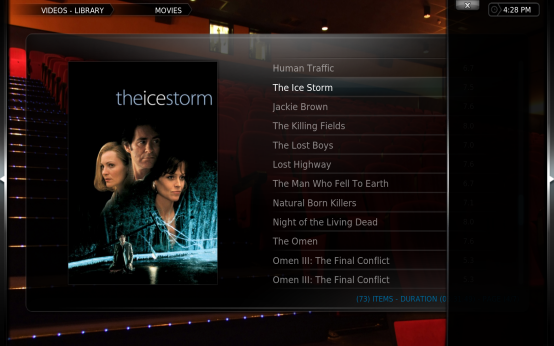 The Settings system menu in XBMC is a bit confusing at first but you get the hang of it eventually. I won’t go into the history of region locking other than to say that it was annoying attempt by Hollywood Studios to stagger DVD pricing and release dates for various international markets (http://en.wikipedia.org/wiki/DVD_region_code). If part of your DVD collection does not match the region setting of your computer’s DVD drive you may find those mismatched discs cannot be ripped by DVDFab. The simplest way to get around this problem is to buy a cheap, secondary DVD-ROM drive and use Windows to change the region setting on it. Internal Desktop DVD-ROM drives can be had for $15 USD and slower USB external drives at about double that. Otherwise you could try convert or hack the DVD drives Region Playback Control but this is potentially risky if you are not comfortable with what you are doing. I do not recommend attempting to flash a laptop DVD drive. If the drive flash fails you could be left with an expensive piece of hardware to replace or dead weight in your machine. Flashing the drive ROM means you replace the internal software (firmware) that operates the drive. A corrupt or broken firmware usually means your DVD disc drive will be irreversibly broken. More information on DVD RPC replacements can be found at http://www.doom9.org/index.html?/rpc1.htm. Audio on DVD can be a pretty complicated and confusing topic as the DVD specification allows for 4 different formats. PCM, DTS, MPEG-2 Audio Layer II (MP2) and Dolby Digital AC-3. In addition to these you may have different tracks of the same format included for different speaker setups. It is common to see AC-3 5.1 and AC-3 2 tracks on the same disk. AC-5.1 is optimised for 5 speakers in surround (the .1 is a sub-woofer) while AC-3 2 is geared towards a traditional stereo 2 speaker setup. Older cinema releases (those prior to mid-1990s) will often use AC-3 2 as the original theatre stereo track or AC-3 1 as the original theatre mono track. Dolby Digital AC-3 is the most common and supported format. It can be the considered the lowest common denominator and should be supported by all audio hardware. If you are trying to optimise space or to keep things simple go for the AC-3 5.1 track or AC-3 2 if no 5.1 track is available. If you are converting an older movie that was released to theatres in stereo or mono you may wish to include both the remixed for DVD surround sound track as well as the original theatre track. MPEG-2 Audio Layer II otherwise known as MP2 is a rare alternative to the Dolby standard only occasionally found on PAL region 2/4 DVDs. Technically its specs are greater than those of AC-3 but you will need to make sure it is supported by your audio hardware. Personally I would choose AC-3 over MP2 just for the greater compatibility. DTS is a well supported alternative format to AC-3. DTS is commonly found in cinemas and has been designed to scale well on many different audio playback setups. If given the choice I would choose DTS over AC-3 though the trade-off is that significantly greater hard disk space is needed for your movie. Whether you actually notice an improvement of your audio playback in DTS over AC-3 is debatable and is probably dependant on your audio hardware. PCM is an exotic format that is rarely found in movie DVD releases though occasionally found in music video titles. Unlike the other 3 standards PCM does not use lossy compression (http://en.wikipedia.org/wiki/Lossy_compression) so in theory is a higher quality and more pure audio format. It is not unlike the audio only compact discs though PCM on DVD has the capacity for a much higher playback quality than CDs. If given the choice of a compressed format over an uncompressed, I will take the uncompressed most times. Unfortunately just like DTS you will trade-off hard disk space for possibly only minor perceivable audio improvements which also will be dependant on your hardware. Also it should be noted that while PCM supports up to 6 audio channels (surround sound) it is usually only implemented as a 2 channel stereo track. Well I hope this was of some help to the many avid DVD collectors out there who may want to move their collections over to a more flexible Home Theatre PC system. If you have any questions please post them in the comments section. Previous Post Mass Effect Windows Vista 64-bit Troubles. Next Post The WordPress eXtended Rss (WXR) Export/Import, XML Document Format Decoded and Explained. A most thorough and simple tutorial! Thanks. I have been using DVD FAB for years so I have the physical discs (~1300) I want to transfer to external hard drive. I have an external blue ray Sony burner. Is my process much simpler? Any thoughts on brand of external hd? Hi, I don’t know, unfortunately. I wrote this guide over 7 years ago now and moved from owning physical media back then. I am not sure if brands for HD are relevant these days as most are owned by the same few parent companies. I’d imagine HD speed is not a big issue due to the slow transfer of the blu-ray player? Going for the professional geared drives would be better than the consumer drives. While more expensive, they generally have longer warranties (5 years vs 1 or 2) so I’d assume are built to last. Maybe make sure your secondary backup drive is a different brand or model from your primpary backup drive. Or at least order the same model from two different retailers. That way you don’t end up with 2 duds from the same batch and loose both backups. Thanks so much! I have actually used HandBrake before on my apple and was able to do it, but it was unreliable most of the time (probably because my disc drive was on its way to the grave). So, I will download it on my PC and see how it goes! I downloaded Boxee last night as well and now I need to get a USB to HDMI converter to get it on my big screen. You did a wonderful job putting this tutorial together and I appreciate your hard work on it! Thanks again, Ben! Hi Brenna, those file names are the nature of the DVD rip as they’re an exact copy of the file format stored on a DVD movie disc. You cannot merge them into a single file without first converting them into another video container format such as AVI, MPG, MP4, DIVX etc. But that requires lots of additional processing. The purpose of the tutorial was to bulk transfer exact copies of DVD movie discs to your hard drive in the quickest and easiest way possible. If you want an easy, all in one package for DVD to MP4 ripping and conversion try SlySoft’s CloneDVD combined with their AnyDVD (to remove the copy protection). They offer 21 day evaluation copies of all their software http://www.slysoft.com/en/download.html. I have followed your instructions to the letter as far as I can tell, but I’m having trouble with how it saves to my H: drive which is my external hard drive. It goes into my H:\Movies as “Title” then it has an Audio and Video folder within the title folder. Within the Video folder it has 12 or so sub folders with the movie itself split up in several 1GB folders. Can I make it all go in one playable folder? I hope that make some sense…Thanks!